The 2015 Scottish Haggis Champion is Mearns T McCaskie of Wemyss Bay. 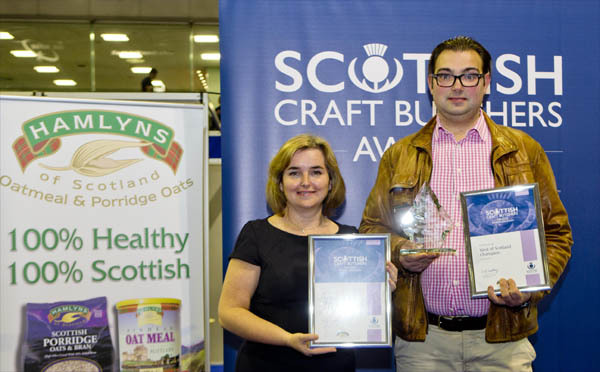 Above: Louise Harley of Grampian Oat Products presenting the title to Nigel Ovens of Mearns T McCaskie in Wemyss Bay. The contest that is held every second year attracted almost 100 entries which were firstly judged by region, and then the regional champions faced another tasting panel of experts to establish the overall winner. The result was a win for the Wemyss Bay haggis. The 2015 Scottish Haggis Championships were held in the Dewars Centre Perth as part of the Scottish Meat Trade Fair on Sunday 10th May.